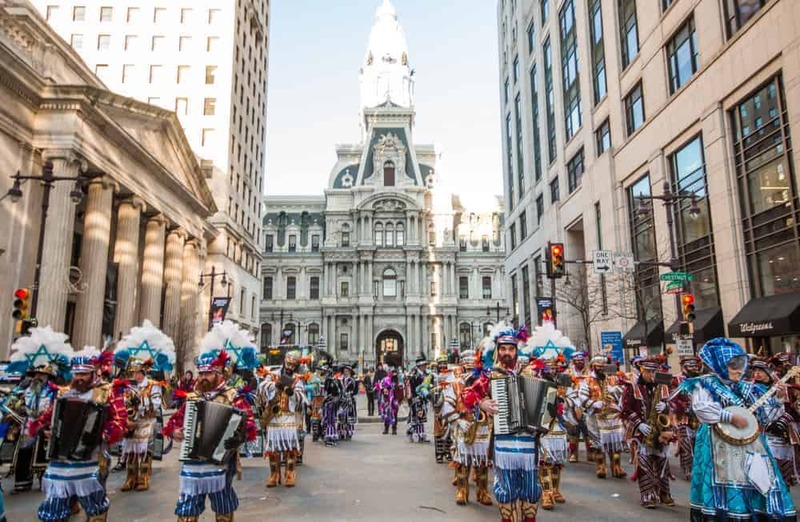 Every New Year’s Day since 1901, the Mummers Parade has been a staple of New Year’s Day in Philadelphia. From their elaborate costumes to their great pageantry and wonderful music, there’s a lot to love about this fantastic cultural event, and it’s worth ending your New Year’s Eve celebrations early to get up and see them. 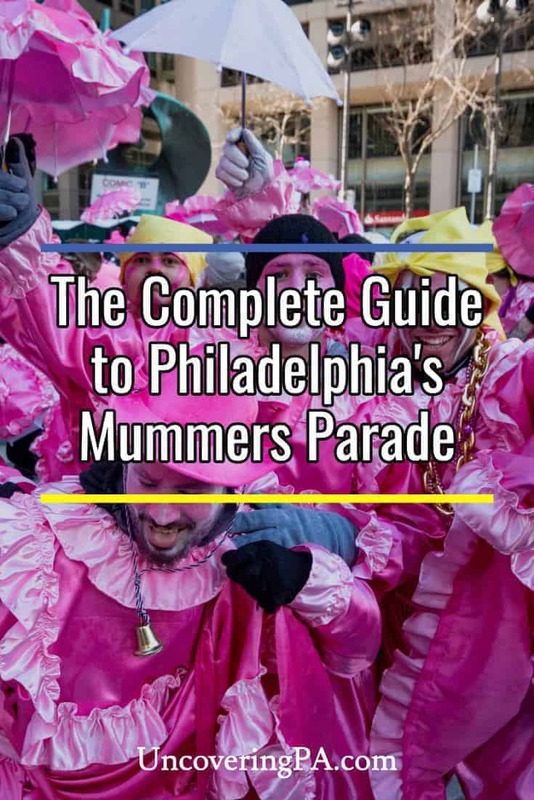 If you’re planning to visit the Mummers Parade on New Year’s Day (and you should at least once), I’ve put together this handy guide which should give you all of the information you need to know. 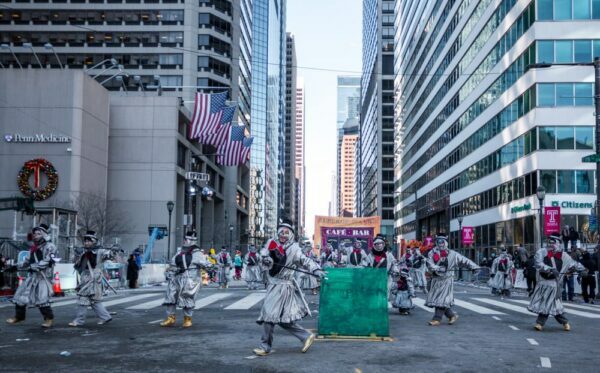 The Mummers have been delighting Philadelphians since the 18th century. The answer to this question is more complicated than most realize. Much of the Mummers’ tradition dates back to Mummers’ Plays in the United Kingdom. These plays include amateur actors in costumes, and are popular during the holiday season. Combine this tradition with customs and ideas from Sweden, Finland, and Pennsylvania Dutch culture, among others, and you get today’s Mummers. 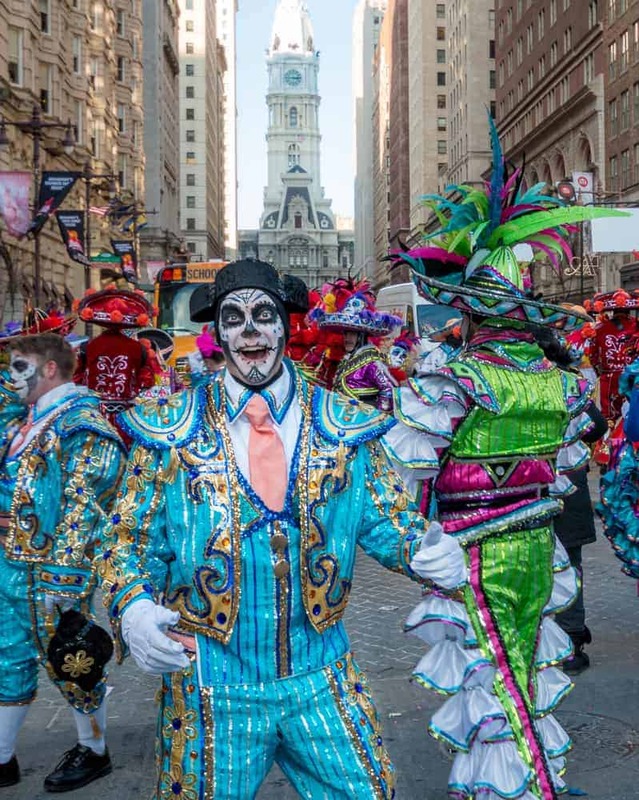 The Mummers have been in Philadelphia for nearly as long as the city has existed, dating back to the 18th century. However, the parade that has become a Philadelphia tradition dates back to 1901. This makes it America’s oldest folk parade. Mummers performances are incredibly varied, but are all exciting to see. 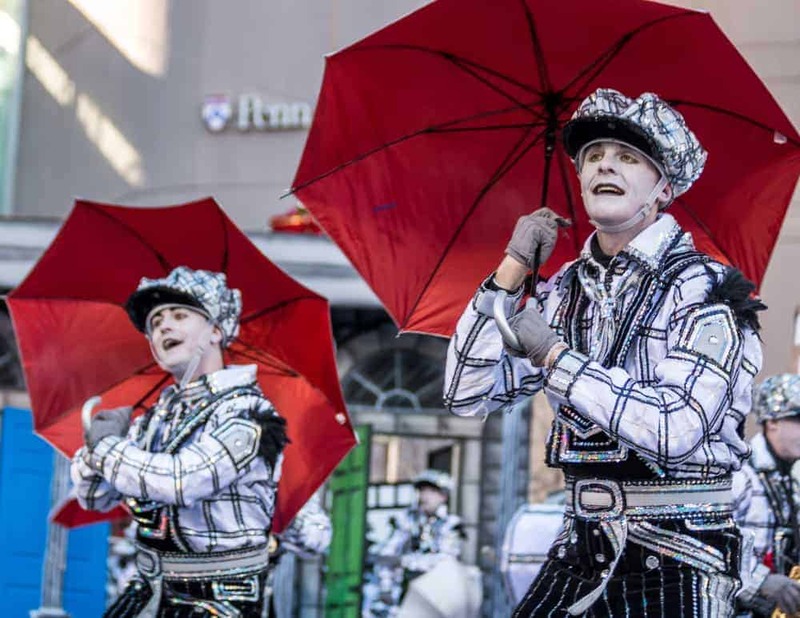 Over the years the groups have changed in types of performances, styles, and inclusivity to make the parade that Philadelphians know and love. Today, thousands of Mummers in more than 36 groups participate in the parade which lasts nearly all day. 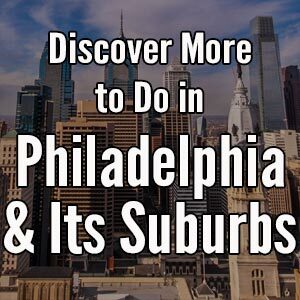 If you want to learn more about the history of the Mummers, a visit to the Mummers Museum in South Philly should be on your list. Groups like the Finnegan Comic Brigade add political commentary into their performances. Throughout the history of the Mummers Parade, there has been controversy surrounding it. 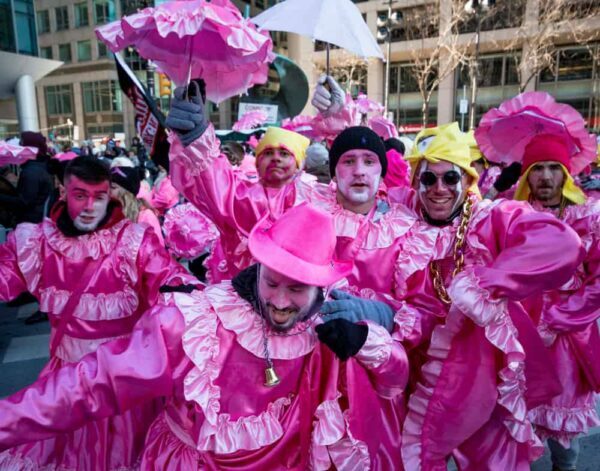 From blackface to insensitive cultural commentary during the performances, the Mummers have managed to offend many throughout their history. In recent years, however, there has been an effort to modernize the Mummers and remove this air of controversy. That’s not to excuse past behavior, but they legitimately are trying to improve their image. Political sketches can be on both the left and right, but are usually done in a fun and humorous way. However, that doesn’t mean that there isn’t political commentary. During my visit to the 2018 Mummers Parade, I saw several plays that included portrayals of President Donald Trump and other political figures. 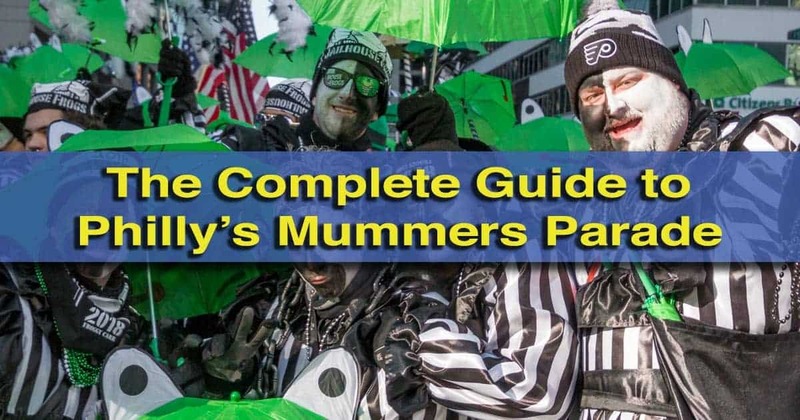 What are the Mummer divisions? String Bands feature intricate shows and amazing musical numbers. 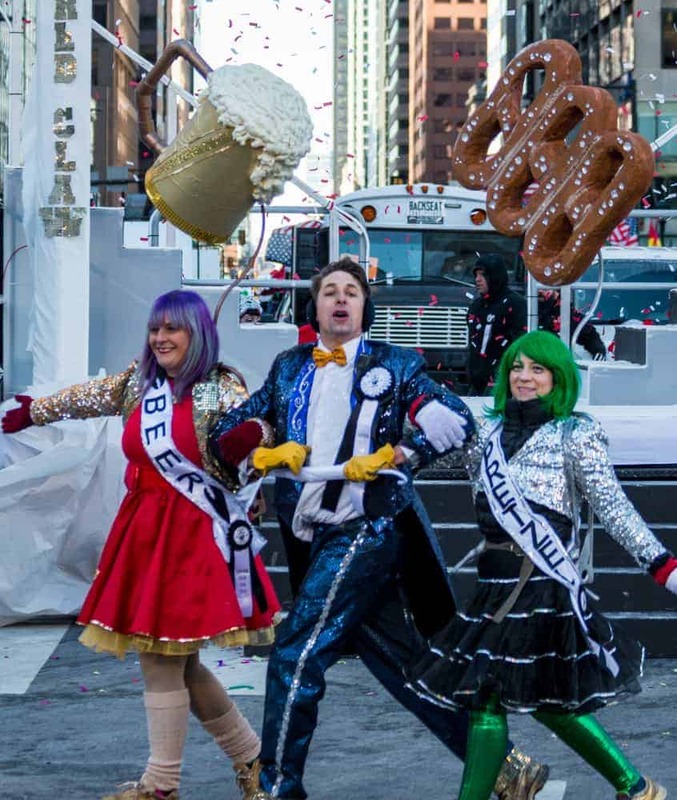 There are five divisions of the Mummers and each provides a unique type of show during the New Year’s Day Mummers Parade in Philly. The most popular Mummers during the parade are the String Bands, which perform highly choreographed musical numbers complete with dancers and props. The bands are composed entirely of amateur musicians and typically include saxophones,accordions, violins, banjos, bass fiddles, drums, and the glockenspiel. Here’s a link to my favorite String Band performance of 2018. The Pennsport String Band parades down Broad Street. The Comics are one of the most controversial aspects of the Mummers as they often tackle political and cultural issues during their performances. Their performances feature pre-recorded music and a mixture of performance and rowdiness. Here’s an example of a Comic performance from the 2018 Mummers Parade. The Wenches are the newest groups of Mummers, but dress in clothing that most resembles what I think of when I think of the Mummers. Together, they perform a theme, but to my untrained eye, it appears that they focus more on having fun and being crazy that on an actual performance. Nevertheless, they are quite fun to watch. They even have trucks full of musicians that follow them through the parade. Here’s an example of a Wench performance from 2018. Some groups dance with colorful umbrellas. The Fancy Division is comprised of just a single Mummers club. These Mummers compete individually or in small groups against each other wearing elaborate costumes and pushing small floats through the parade. They also have a small show that they perform for the judges. Check out some example performances here. Lastly, the Fancy Brigade became its own division in 1978 and performs with sophisticated props and choreography that is reminiscent of mini Broadway plays. While they do parade down Broad Street at the beginning of the show, due to the complexity of their sets, their performances along the route are limited. Instead, they perform their full shows inside the Pennsylvania Convention Center. Here is the 2018 winning performance in the division. When is the Mummers Parade? The Mummers Parade lasts all day with groups walking down Broad Street after their main performances. 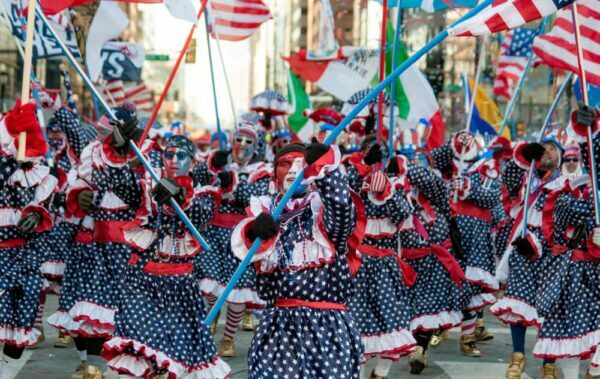 The Mummers Parade is held in downtown Philadelphia every New Year’s Day. The Parade typically starts at 9am. The last group is scheduled to start the parade around 3:30pm, but the parade tends to go longer than that. It’s at least another 30-40 minutes before all of the groups have finished parading down Broad Street. While the entire parade is worth seeing, I was surprised at how few people were on the street during the morning hours. The parade seems to draw more interest the closer it gets to noon. 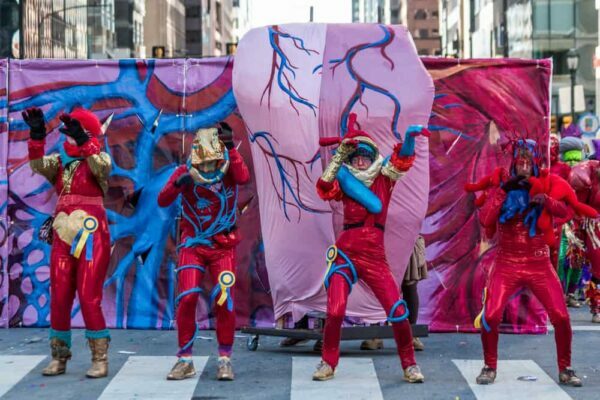 What is the Mummers Parade Route? The Quaker City String Band parades down Broad Street. The route for the Mummers Parade has changed over the years, but has remained fairly consistent over the last few years. The parade starts on the western side of City Hall at Market Street. Here, Mummers groups start their parade by performing for the judges. Only a small number of bleacher seats are available at this spot. Most Mummers groups start by performing on the western side of City Hall. From there, the Mummers parade around City Hall to Broad Street and walk south down Broad Street for one mile and end at Washington Avenue. Along the way, they stop periodically for performances. The Fancy Brigades do march in the Mummers Parade early in the morning, but save their main performances for inside the Pennsylvania Convention Center. 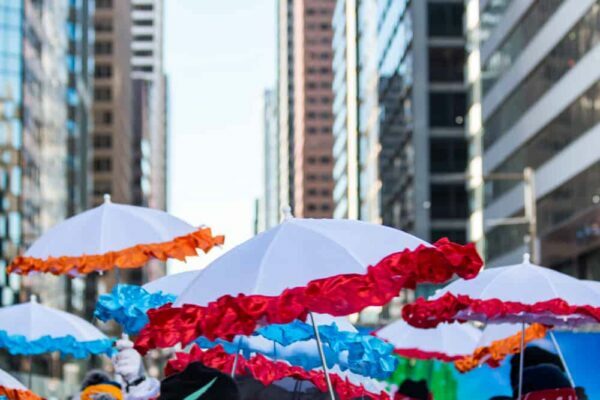 How can I see the Mummers Parade in person? The best place to see the performances is from the west side of City Hall. The Mummers Parade is a fantastic tradition and should be seen at least once. Along the parade route, visitors are allowed to stand along Broad Street and watch the Mummers parade down the street. There is no cost for these standing-room only seats. However, if the weather is nice, it can get crowded very quickly, so come early if you want a good spot. The main performance area on the west side of City Hall is only available to those with tickets. Tickets for the main performance area entitle you to bleacher seating here. While you can see mini versions of the performances along the parade route, there’s nowhere better to see the shows than next to the judges as the groups will have the most energy and all of their props here. Tickets are required for the bleachers near the main performance area. The Fancy Brigade shows at the Pennsylvania Convention Center is also a ticketed event and can only be seen if you have tickets. Shows are generally performed once in the morning and once in the evening. Tickets for both the Fancy Brigade finale and the bleacher seats can be obtained from the Independence Visitor Center. Where are the best places to view the Mummers Parade for free? 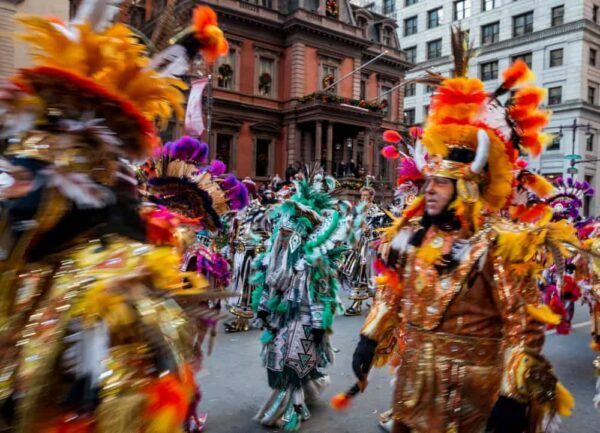 The easiest way to see the Mummers Parade is to watch from Broad Street. 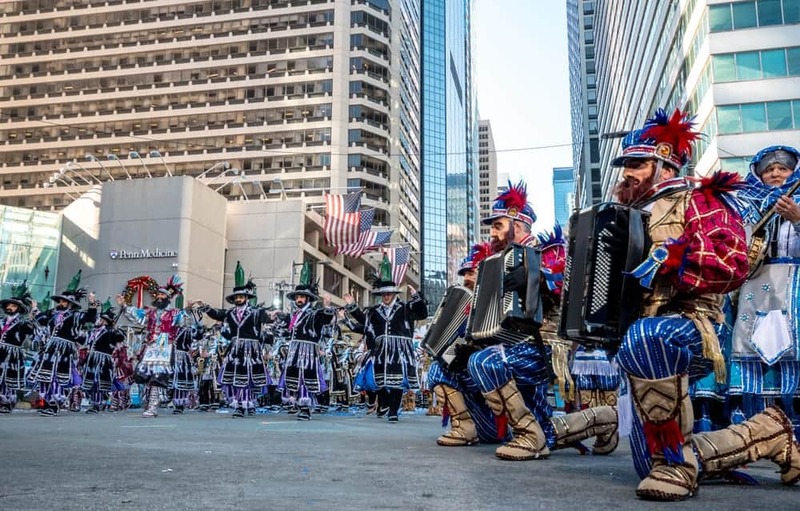 If you are unable to obtain a ticket for the Mummers Parade’s main performance area, that doesn’t mean that you can’t still see the performances. The String Bands, Fancy Division, Comics, and Wenches all perform their shows along Broad Street at several different points. The String Bands perform at Broad and Sansom Streets in front of the Union League. The Fancy Division, Fancy Brigades, Comics, and Wenches perform at Broad and Pine Streets. All groups then perform again at Broad and Carpenter Streets. Keep in mind that these free performance areas along Broad Street will be very crowded throughout the day. Can I watch the Mummers Parade on TV or can I stream it online? The Mummers Parade is shown on TV in the Philly area and streamed live online. 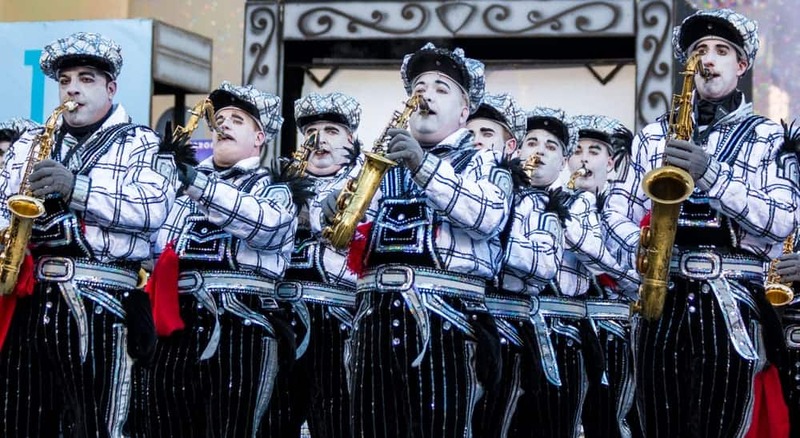 The Mummers Parade is broadcast locally on PHL17 from approximately 9:30am until 5pm. 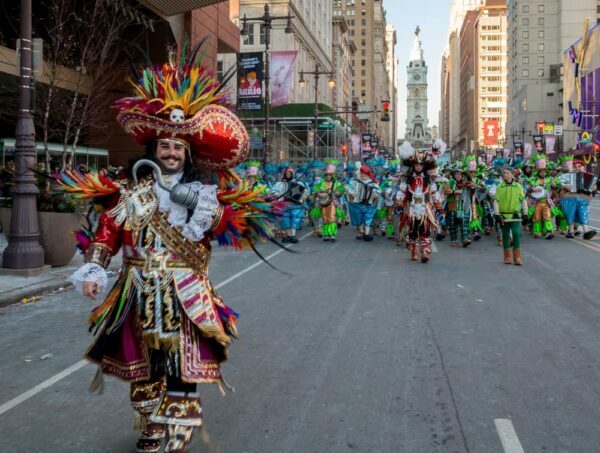 Those outside of the viewing area can stream the Mummers Parade on PHL17’s website during the same hours. The Fancy Brigade performances are streamed starting at 8pm on New Year’s Day. 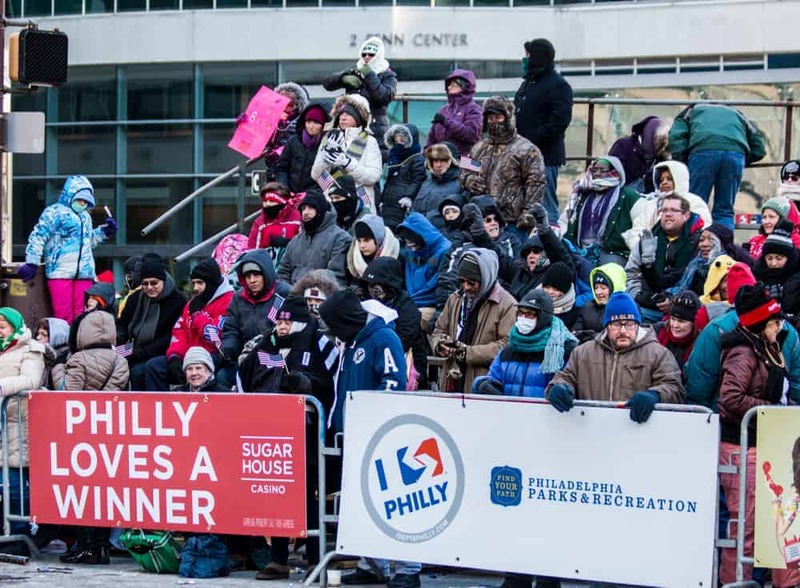 After the parade, performances and judging results are generally made available within a few hours on PHL17’s website, as well as on YouTube. What is the 2nd Street Strut? The 2nd Street Strut offers the chance to see the Mummers in an even more festive setting. After the Mummers Parade, Mummers head over to 2nd Street (known locally as “Two Street”) between Washington Avenue and West Ritner Street for the 2nd Street Strut. This area is home to the fantastic Mummers Museum as well as many of the Mummers’ clubhouses. Along the street there is a very festive and party-like atmosphere. Mummers groups parade down the street here interacting with revelers and having a good time. The party tends to start in the middle of the afternoon, but really gets going in the evening after the Mummers Parade has concluded. The party continues until approximately 10pm. If you can, swing by the Miracle on South 13th Street, which ends their festive display on New Year’s Day. There’s nothing quite like seeing the Mummers Parade in person. 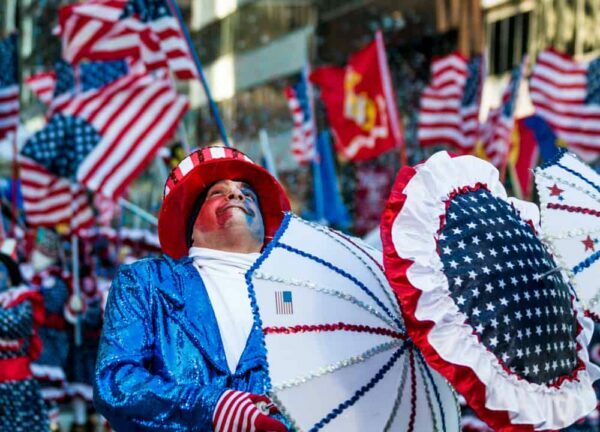 Without a doubt, the Mummers Parade is something that everyone should experience at least once. 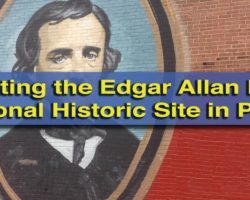 The festive atmosphere, intricate costumes, and incredible performances combine to make this one of the best things to do in Pennsylvania. Definitely add the Mummers Parade to your must-do list. 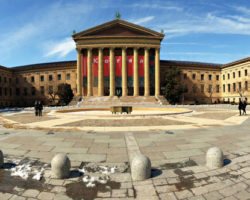 Looking for even more things to do in Philly? 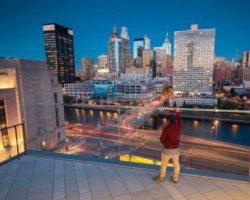 Check out the Ultimate List of Completely Free Things to Do in Philadelphia and Our Guide to Philly for First-Time Visitors. 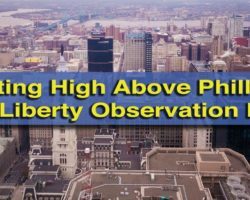 Great article Jim and amazing photos. I think you captured the image of mummery perfectly. I agree Fralinger had a great show. I also loved Duffy and twelve year old Captain Jake Kudrick. He replaced his dad as captain who passed away earlier in 2017. And he tied for 4th place as Captain :-). So glad you were able to experience it live in the city where I grew up. It should definitely be on everyone’s bucket list.